Email Rebecca Laclair to receive a Swag Duet! But the genius behind every one of Grounder’s hits is Stanford Lysandre, their heroin-addicted, self-taught lead guitarist. Zac is so jealous he could kill him. Determined to win, Zac realizes that Shelby can do what he can’t—hear the music inside him, uncover his feelings, and help him create his own singular style. As Shelby gets closer to the band, she discovers Stanford’s secret to writing his music. It’s a power very familiar to her, but life-affirming and not destructive. Can Shelby hide her connection to Zac’s enemy? 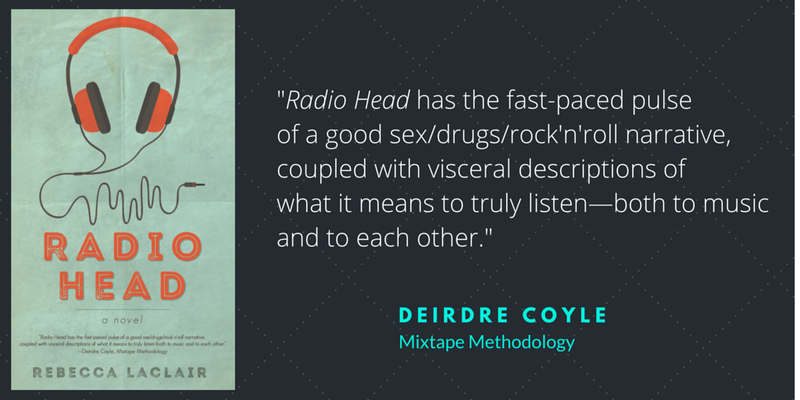 Begin reading a FREE excerpt at Mixtape Methodology magazine. Yes, there’s more! Email Rebecca at writerrlaclair (at) gmail (dot) com, and you’ll receive a limited edition, autographed bookmark, and a book plate with custom message, just for you! Stay in touch! Subscribe to this blog or chat with author Rebecca Laclair on Twitter at @WriterRLaclair. Looking for fun graphics and free memes? Visit the official RADIO HEAD Pinterest page! Robin, we have so much in common! I’d love to learn more about your book–please send a link! I visit classrooms via Skype to talk about using music in creative writing. We should set up a “visit” and talk! !